This week’s Jewelry Feature of the Week is “Red Dots in a Plastic Bag” Ring. I think I may have listening to one of LL Cool J’s old school songs when I created this ring, hence the name. 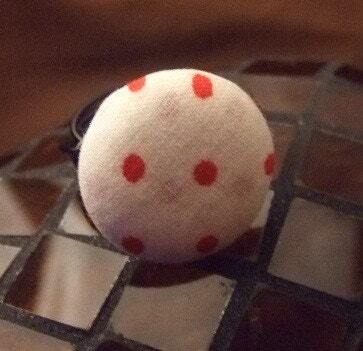 This red polka dot ring fabric ring sits on a black copper wire band. The contrast of red, white and black make the perfect combination. Sold exclusively on our Etsy site for only $13. I simply love that piece. Very Cute!